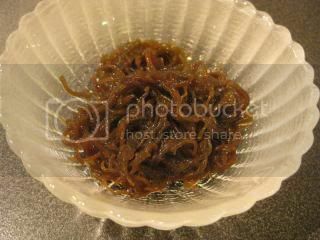 It's still much less known than wakame or hijiki in the US, but Mozuku Seaweed is a very popular type of seaweed in Japan. Originally from Okinawa, it's dark brown, extremely slimy and the flavor is quite neutral on its own. It's a versatile ingredient for a wide variety of dishes. Especially in the summertime, Japanese people love to eat mozuku so much. The most popular way to eat is to serve it cold in a vinegar sauce (called "Mozuku-su"). I have cravings for "Mozuku-su" every day. It's so refreshing and tasty, and the big bonus is Mozuku is extremely healthy so-called Super Food! Here in LA, luckily, we can find good quality mozuku at Japanese markets. The kind I buy is a package of fully-matured mozuku from Okinawa. You can use it right out of the package, so no rinsing or cutting is necessary. 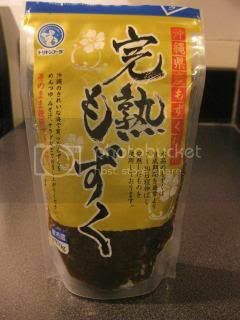 Mozuku is very low in calories, and packed with amazing level of nutrients. It's high in fucoidan, amino acid, and fibers, and gives antioxidant effect. It works not only to help keeping your blood sugar level low but also to help your blood flow become smooth and lowering your cholesterol level. For the best effect, it's good to eat mozuku at the beginning of a meal. The slimy part of the mozuku is known to help strengthening your immune system cleaning intestine. How I like to eat mozuku is very simple and easy. I simply eat it with a quick vinegar sauce I make with my homemade Kyoto-style "Awase-zu" and dashi stock. I also put some shredded mountain yam ("yamaimo") and grilled okra. So, they make a healthy slimy trio. With the vinegar sauce, it's keeps me extremely healthy in the hot summer season. Here's my recipe. Combine the ingredients for the sauce. Keep it chilled. Keep all the other ingredients chilled before assembling. Divide the mozuku in 2 small bowls. Top each with okra, "yama-imo", and shiso leaves.